What Causes NDM-1 to Be Produced in Bacteria? What Are Symptoms and Signs of a Person Infected With Bacteria Carrying NDM-1? How Are Bacteria That Produce NDM-1 Identified? What Is the Treatment for an Infection Caused by Bacteria That Make NDM-1? What Is the Prognosis for a Person Infected With NDM-1 Producing Bacteria? Can Infections With Bacteria Containing NDM-1 Be Prevented? Why Are Doctors and Researchers So Concerned About Bacteria With NDM-1? Where Can People Find More Information About NDM-1 Producing Bacteria? NDM-1 is an abbreviated way to write New Delhi metallo-beta-lactamase, which is the name given to an enzyme discovered in 2009, which is able to be produced by several genera of bacteria that render the bacteria resistant to many antibiotics in common use around the world. This enzyme belongs to a group of enzymes (beta-lactamases) that are capable of breaking the chemical bonds of a beta-lactam ring, which composes an important part of many antibiotics such as drugs of the penicillin, cephalosporin, and carbapenem groups. Most of the beta-lactamase enzymes are effective on some or most of the older antibiotics like penicillins and cephalosporins. NDM-1 is effective on both the old antibiotics and the newer carbapenem antibiotics, such as imipenem, that contain a beta-lactam ring. Klebsiella were the first bacteria identified in 2009 to produce NDM-1 in a patient that traveled from India to England with an infection that did not respond to many antibiotics. The organism was resistant to beta-lactams and, after the organism's genetic and antibiotic resistance mechanisms were studied, NDM-1 and its genetic source were discovered. The genetic source was a plasmid termed "blaNDM-1," and since that discovery, other bacterial genera have been found to have blaNDM-1 integrated into other plasmids or into the bacterial chromosome, thus allowing the bacteria to produce NDM-1. NDM-1, while effective against almost all antibiotics with beta-lactam rings, is not effective in producing antibiotic resistance against other types of antibiotics such as fluoroquinolones (for example, ciprofloxacin [Cipro] and levofloxacin [Levaquin]) or aminoglycosides (for example, gentamicin [Garamycin] and streptomycin [Streptomycin]). Unfortunately, most of the strains of bacteria that have NDM-1 also have either plasmid or chromosomal resistance against these (and other) antibiotics. The term "superbug" is often used loosely to describe organisms resistant to usually two or more antibiotics that are usually effective. Because bacteria that contain NDM-1 are often resistant to almost every antibiotic, bacteria with NDM-1 have been termed a superbug. Some investigators consider these bacteria to represent the most dangerous superbug of all that have developed so far. Although newly discovered in 2009 and most likely because of genetic transfer of plasmids or other chromosomal segments, NDM-1 has been found in at least four different genera of gram-negative bacteria (Klebsiella, Escherichia, Enterobacter, and Acinetobacter). In addition, people in India, Pakistan, England, Canada, Sweden, Australia, Japan, and the U.S. have been found to be infected with bacterial strains that produce NDM-1. Researchers speculate that the extremely fast spread of NDM-1 may be due to patients seeking medical care outside of their home country (for example, visitors or travelers from India). Others suggest the widespread and uncontrolled use of antibiotics favors the survival of NDM-1-containing bacterial strains. Another possible reason for fast spread is that Escherichia coli (E. coli), part of the normal bacteria found in the human intestine, readily exchanges plasmids. In fact, the first identified patient infected with Klebsiella containing NDM-1 was subsequently found to have an E. coli strain, isolated from the feces, capable of producing NDM-1. The genetic code (blaNDM-1) located on either a plasmid or integrated into the bacterial chromosome is responsible for the synthesis of the enzyme NDM-1. Researchers suggest that environmental pressures, such as the use or overuse of antibiotics, selected for bacteria that could synthesize this enzyme to survive. Some speculate that because there are fewer restrictions on the use of antibiotics in many countries, antibiotic-resistant strains are likely to be produced in these countries; with NDM-1, some investigators suggest India is where this genetic element first developed. 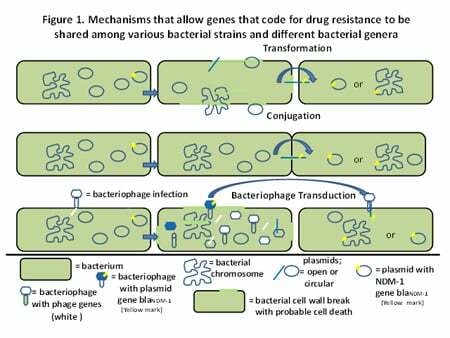 Figure 1 is a schematic diagram that shows the various methods bacteria use to transfer genetic material among different bacterial types. The first method, transformation, occurs when a bacterium's cell wall breaks down during bacterial cell death and the bacterial genetic material (both chromosomal and plasmid) are released into the environment. Other nearby bacteria then can absorb the genetic material and incorporate the absorbed genes into its own plasmids or chromosome. The second method, conjugation, occurs when two bacteria share a connection through their cell walls that allows genetic material (plasmids or gene fragments) to pass into another bacterium that can incorporate the plasmid or gene fragments into other plasmids or the chromosome. The last method, transduction, is more complicated. The first step involves a bacteriophage (a type of virus that infects bacteria) that attaches and injects its genome (Fig. 1, white line) into a bacterium. The bacteriophage genome then "takes over" the bacterial cell and synthesizes bacteriophage parts that are reassembled into new bacteriophages. However, during reassembly, sometimes genes from plasmids or the bacterial chromosome genetic material are mistakenly put into the bacteriophage particle (Fig.1, hexagonal-shaped structure, termed a capsid) instead of only viral genes. After reassembly is done, the bacteriophage breaks open the bacterial cell wall and the new bacteriophages then can reinfect other bacteria. Not all bacteriophage-infected bacteria die; some survive. Those bacteria that are infected with bacteriophage genetic material that contained genes from bacterial plasmids or from the bacterial chromosome then can incorporate the plasmid or chromosomal genes into their own plasmids or chromosome. These types of genetic transfers are responsible for the synthesis of the multiple enzymes like NDM-1 that allow bacteria to become resistant to many antibiotics. Such antibiotic-resistant genes are often closely linked together, and even multiple linked genes can be transferred by these methods at the same time. The major sign or symptom that a person is infected with bacteria carrying NDM-1 is failure of antibiotic treatments (oral or IV) to improve the patient's condition, especially if the patient is infected with a gram-negative bacterial type and is being treated with an antibiotic that contains a beta-lactam ring structure. In addition, if the person has gone to another country (for example, India) for elective surgery or was recently treated with antibiotics for an infection and has returned to the U.S. or another industrialized country with the infection, caregivers should be suspicious that a bacteria producing NDM-1 may be causing the infection. Currently, these are the major clues to suggest infection with NDM-1. Because NDM-1 can be carried by several types of gram-negative bacteria, the signs and symptoms of the diseases are of little or no help in distinguishing whether the patient has an organism expressing the enzyme until antibiotic treatments fail. However, because gram-negative bacteria are known to cause many diseases (for example, gastrointestinal problems, urinary tract infections, pneumonia, and some wound infections), patients with these diseases that require antibiotic treatments and are not recovering appropriately with treatments should have the gram-negative bacteria isolated and tested for antibiotic resistance. Any person who has been diagnosed with an infection caused by NDM-1 and still has symptoms of the infection needs to seek medical care, even if they are taking antibiotics. Currently, most people diagnosed with NDM-1 bacterial infections are hospitalized, but some people are discharged and sent home, often with "home" being in another country. These people should seek medical care immediately to prevent further spread of the infection. In addition, any person who develops an infection with gram-negative bacteria who has had any close contact with someone known to have NDM-1 bacteria, both as an infection or as a carrier, should seek medical care and inform the caregiver of their potential association with NDM-1 bacteria. Although it is standard practice to test all bacteria isolated from an infected patient, some hospitals may not test for carbapenem resistance because resistance to it is relatively infrequent in most industrialized countries currently. Although this situation may change quickly, if gram-negative isolates show resistance to penicillins, they probably should be tested for carbapenem resistance. If the patient is known to travel to areas where NDM-1 is frequently found (India, Pakistan), the isolated gram-negative bacteria should be immediately tested for carbapenem resistance. This test, however, does not determine that the infecting bacteria possess NDM-1 because there are a few other enzymes (for example, Klebsiella pneumoniae carbapenemase also termed KPC) that can cause resistance to carbapenems, but they are not as effective as NDM-1. If a carbapenem-resistant bacterial strain is recovered from a patient, the bacteria should be sent to a state public-health laboratory or the U.S. Centers for Disease Control and Prevention (CDC) for specific testing for NDM-1, because testing for NDM-1 is not routinely available. Patients who have bacteria isolated from their infective site that have detectable NDM-1 by the state or CDC facilities are then definitively diagnosed as having an infection caused by bacteria that produce NDM-1. The best treatment for an infection caused by bacteria that make NDM-1 is to determine which antibiotics the NDM-1 strain is susceptible (not resistant) to and use those antibiotics for patient treatment. One antibiotic, colistin, which is infrequently used because of its toxicity, is often the only antibiotic to which NDM-1-producing bacteria are susceptible. However, some NDM-1-producing bacteria have shown sensitivity to tigecycline (Tygacil) and a few to aztreonam (Azactam). However, these antibiotics should not be used without first determining the resistance/susceptibility pattern for the individual infecting bacterial strain. 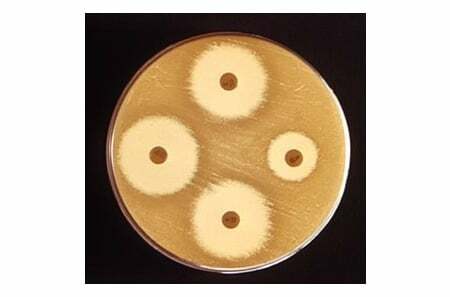 Antibiotic resistance/susceptibility patterns for bacteria are routinely done in labs that grow isolated bacterial strains in the presence of antibiotic-impregnated disks. Resistant bacteria grow up to the disk edge, while bacteria susceptible to being inhibited or killed by the antibiotic leave a clear space of no growth that extends away from the disk edge. The larger the clear space, the more susceptible is the bacterial strain to the antibiotic (see example, Figure 2). Most NDM-1-producing bacteria show no clear space. One problem with this test is that it takes about two days to get results. Researchers at GlaxoSmithKline have identified a new antibiotic compound that may inhibit bacterial topoisomerase function in NDM-1-containing bacteria. Consequently, the bacterial replication (growth) is inhibited or stopped. Unfortunately, the compound has not gone through any clinical trials and is not likely to be commercially available very soon, since no clinical trials are currently scheduled. The prognosis (outcome) for a person infected with NDM-1 is related to the patient's overall condition at the time of diagnosis and appropriate treatment. In general, patients with antibiotic-resistant bacteria have more complications and longer hospital stays than those who have antibiotic-susceptible organisms. The quicker the bacteria are shown to contain NDM-1, the faster appropriate treatment can begin and the better the prognosis for the patient. If the NDM-1-producing bacteria are susceptible to colistin, the prognosis is usually good. However, patients on respirators, immunocompromised patients, and patients in intensive-care units have a more guarded prognosis. The chance of infections with bacteria containing NDM-1 can be reduced or even prevented by fairly simple hygienic methods that include hand washing, adequate treatment of water supplies, washing vegetables, and avoiding areas and people known to harbor NDM-1-producing bacteria. The usual infection protective techniques available in hospitals should be used. Patients with NDM-1 bacteria should be treated like patients with MRSA, with a private room with gloves, and masks and gowns should be made available for caregivers and visitors. There is no vaccine available for bacteria that produce NDM-1, and it is unlikely one will be developed because so many bacterial strains may have the potential to produce NDM-1 if given the appropriate genes. Many medical caregivers and researchers are concerned about NDM-1 because it renders some of the most useful and powerful antibiotics (carbapenems) ineffective. These antibiotics are often the medications of choice for severe infections. In addition, since the blaNDM-1 gene that produces the enzyme is often associated with other genes that code for other antibiotic-resistance factors, they are concerned that such resistance will be quickly passed to most gram-negative bacteria, thus rendering a huge group of bacteria resistant to most of the currently used antibiotics. Although this spread is unlikely to be considered a pandemic like bird or swine flu, outbreaks of diseases caused by NDM-1 bacteria could result in high mortality. Researchers also are concerned that current antibiotic susceptibility tests often may take a minimum of two days to complete, which for a critically infected patient may be a long time to be treated with antibiotics that may not have the ability to inhibit or kill infecting bacteria. The field of research on NDM-1 is extremely active at this time. There should be many developments in clinical diagnostic methods, antibiotic treatment plans, and antibiotics in the near future. Unfortunately, the number of people infected with and carrying NDM-1 bacteria is likely to increase rapidly. Researchers plan to try to stay a step ahead of these potentially dangerous antibiotic-resistant bacteria, but there is no guarantee they will be successful. Prevention of infection is the best defense against these bacteria. Deshpande, P., C. Rodrigues, A. Shetty, et al. "New Delhi Metallo-β lactamase (NDM-1) in Enterobacteriaceae: Treatment Options With Carbapenems Compromised." J. Assn. Physicians India 58 (2010): 147–150. Yong, D., M. Toleman, C. Giske, et al. "Characterization of a New Metallo-β-Lactamase Gene, blaNDM-1, and a Novel Erythromycin Esterase Gene Carried on a Unique Genetic Structure in Klebsiella pneumoniae Sequence Type 14 from India." Antimicrob Agents and Chemother. 53.12 Dec. 2009: 5046-5054. Tell us about your experience with NDM-1 bacteria infection. What was the treatment for your NDM-1 bacteria infection? What prevention measures do you use to avoid getting NDM-1?